ARE PRESEDENT DONALD J TRUMP SAYED HE WOULD NUKE BOMB THE ISIS AND THE RADCAL MUSLAMIC MUSLINS TO STOP THE SHAKIRA LAWS!!! AND HE SHOULD DO WHAT HE SAYED HE WAS GOING TO DO!!! EVEN JOHN MCANE SAYED IT TO BOMB BOMB BOMB BOMB BOMB IRAN WHEN HE WAS ALL MOST PRESEDENT BUT THAN THE DUMBOCRATS CHEATED SO THAN WE HAD OBUMMER AS THE PRESEDENT AND HE WAS PART OFF THE RADCAL MUSLAMIC BROTHER HOODS BUT NOW WE CAN FINALY GET RIT OFF THE ISIS AND THE SHAKIRA LAWS ONE TIME AND FOR ALL!!! AND I WANT TO THANK ARE FOLLOWER MARK FOR THE IDEA FOR THIS MEME!!! 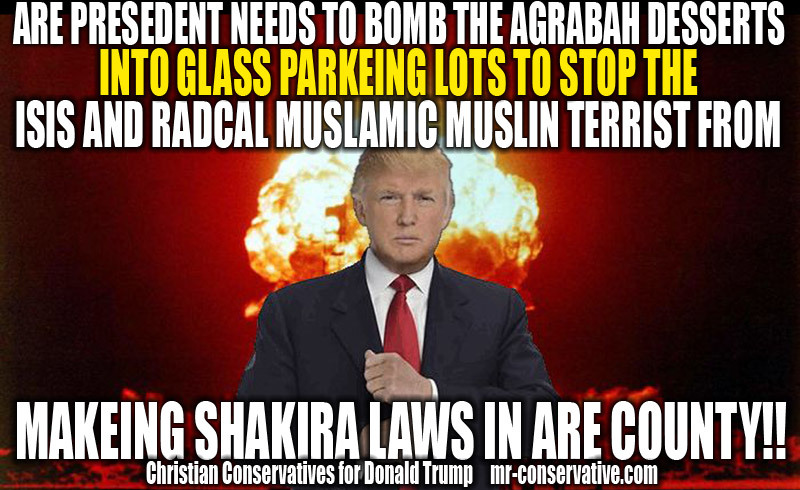 PLEASE LIKE AND SHARE IF YOU THINK ARE PRESEDENT DONALD J TRUMP SHOULD STOP THE SHAKIRA LAWS AND NUKE BOMB THE ISIS!